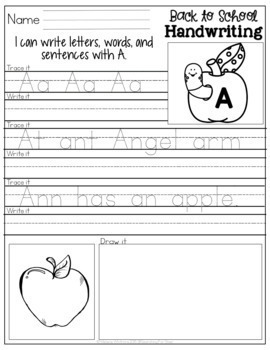 Practice writing letters, words, and sentences for each letter of the alphabet! 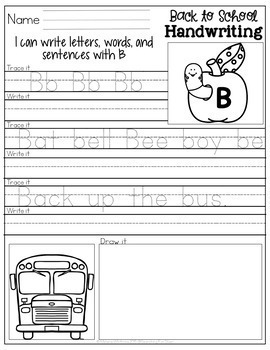 This back to school-themed packet will have them ready for the year by practicing and improving handwriting. 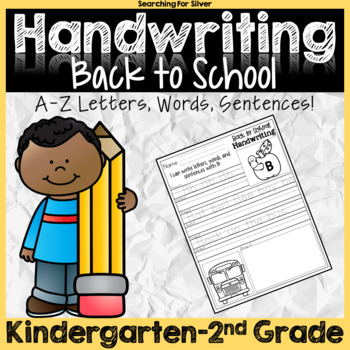 For preschool, kindergarten, and first grade. FUN graphics and words make handwriting exciting! Includes 26 pages. Each page is a different letter of the alphabet with practice in uppercase and lowercase letters, words that contain the letter, and sentences. Also includes an area to draw the sentence. Students practice spelling words and constructing a proper sentence. 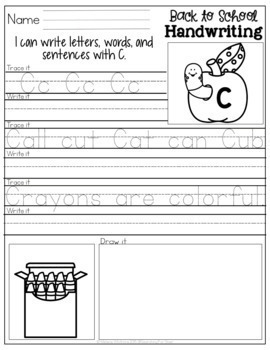 Once they write the sentence, they can draw a picture to demonstrate comprehension. **If you have a question, comment, find errors or see a need for a technical update to a product, please leave me a message in the “ask a question” section of my store. Copyright © Melanie Whitmire 2017 @Searching for Silver-All rights reserved by the author.